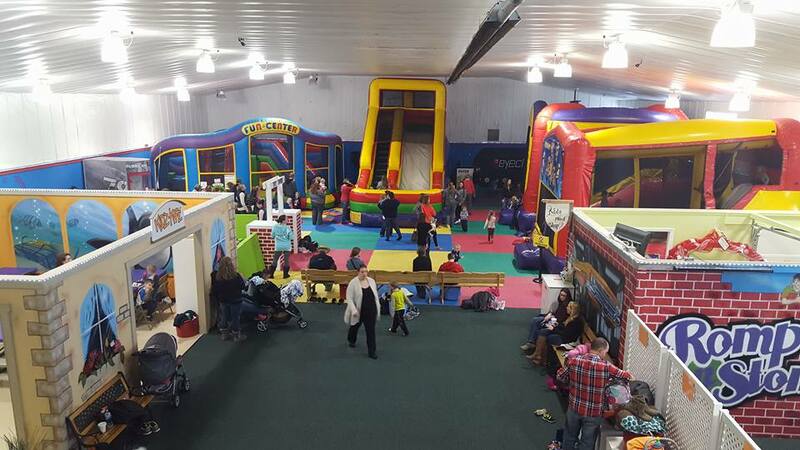 If your kids are starting to get cabin fever during their break from school this week, I have an excellent suggestion: take them to burn off — I mean bounce off — their energy at Romp n Stomp Inflatables and Fun Center, located in Medina. When my husband and I took our two boys last Friday, Dec. 23, we were pleasantly surprised by the variety of activities available; the welcoming, clean environment; and especially the friendly, energetic staff. Our 3-year-old was on the younger side of the children in attendance. Add to that the fact that he’s extremely cautious, and I wasn’t sure how willing he’d be to enjoy the inflatables — particularly since parents aren’t allowed on them. It turned out I had no reason to be worried; the handful of inflatables range in “difficulty level,” so to speak, so there’s enough to keep even tiny tots busy. Mesh sides ensured he could see me or dad at nearly all times. And, thankfully, if he got stuck or nervous, a staff member (called a Bouncer Buddy) quickly hopped in the air-filled structures and kindly helped him out. By the end of the open play session, he’d visited every inflatable multiple times, but mostly loved sliding down the giant, fast slide that takes center stage in the enormous room. Aside from the inflatables and the well-equipped snack bar, other entertainment included a play area with several different types of giant building blocks, an interactive “eyeclick” mat that displayed games kids could play that involved them running around and stepping on moving images, and a separate play area for very young children. Our youngest son, who is 11 months old, was thoroughly entertained in the play area for the whole two hours we were there. He’s considered a “crawler” and got into Romp n Stomp for half-price admission. Bonus: no one caught a cold after our visit (even baby brother, who puts everything in his mouth at this point). I could tell from the room’s appearance that the staff must regularly wipe things down because the whole place was spotless! Extra “mom points” scored! In addition to open play hours, this week Romp n Stomp will host special day camps and a New Year’s Eve bash on Dec. 31. For more information, including a calendar, visit www.rompnstompcenter.net.